This ecological reserve is subject to special restrictions. Robson Bight (Michael Bigg) Ecological Reserve was established to provide a sanctuary for killer whales. The reserve protects key habitats for killer whales and prevents their harassment while at the same time provides unique opportunities for killer whale research. 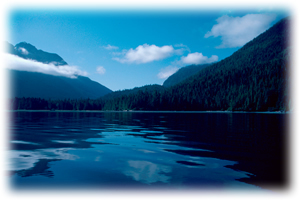 Robson Bight (Michael Bigg) Ecological Reserve also protects a pristine estuary and forested shorelines. Robson Bight (Michael Bigg) Ecological Reserve brochure, including detailed map.